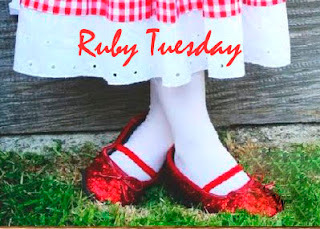 What have you got this week for Ruby Tuesday? I love this photo. Happy Monday! Beautiful and original composition with that nice apple contrast, I like, great. What a beautiful and remarkable picture. I had to study for a long time before I decided it was a picture of a painting. It might also be great photoshop work. Teach Mary, you are good at both. Have a nice Ruby Tuesday with or without apples. It's a photo of a picture? I didn't get that at all until I saw Felisol's comment and then I had to go back and check again. Who painted it, it's beautiful! Love this shot! Happy RT. I love this photo. The red is so vivid and there is an emotion in the presentation that evokes childhood memories. Lovely presentation of a well-known teacher's symbol! Just in time for World teachers' Day on Friday! I love apples and this shot! Great composition and photo. Happy Ruby Tuesday! Excellant picture. I love it! Hey Mary! We are the ones who should be leaving you an apple for the "teach", instead of you leaving one for us! Thanks!! Love that book shot with the apple. perfect! Hi Mary! Hope you are doing well. Trying to get back to swing of things :) I was thinking about playing RT again. I'll start next week. Good night! That's an unusual and well set up shot, Mary. Really lush! Hi! joining this week's RT. Love the photo. Great shot and composition. Love the fibrant "reds". I just joined your blog...I love it. Thanks you Theresa from TexWisGirl! Wonderful photo. Thank you for hosting and have a fun day! 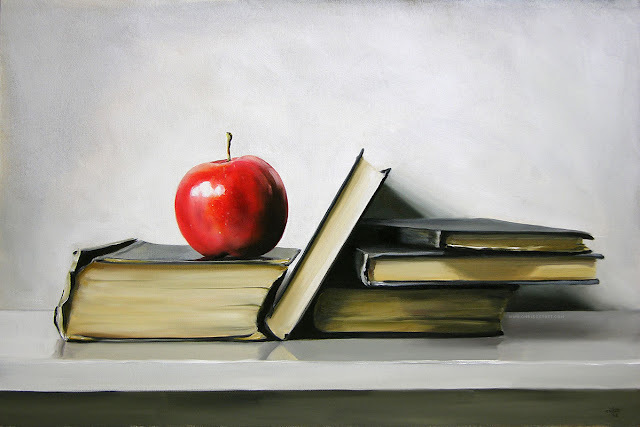 I love the way you placed a bright red apple with old books. loving the photograph - beautiful still life; brilliant apple! the red apple really jumps out and grabs you. great contrast. This should be fun!! Love red. visiting and saying happy Monday to you!